Charter Communications Inc. (NASDAQ:CHTR, share price on 14/09/2015: 184.09$) and Time Warner Cable Inc. (NYSE: TWC, share price on 14/09/2015: 187$), following Comcast’s resignation, have entered into an Agreement and Plan of Mergers on the 26th of May, under which both TWC and Charter will become wholly owned subsidiaries of New Charter following a series of merger transactions. This article has the purpose to underline the deal’s major business opportunities and value drivers. Internet of things. It is emerging rapidly and it has the potential to connect 28 billion “things” to the internet by 2020, to decrease cost of bandwidth and to improve wireless coverage. Furthermore, it is estimated to generate nearly $15 trillion in economic value in areas such as efficiency, productivity, cost reduction and increased customer base. In particular, the US cable market is healthy but hardly competitive. In the five years to 2015, growth in high-speed internet subscribers and a rise in consumer spending have driven industry growth. Over this period, revenue is expected to increase at an annualized rate of 4.2% to $115.9 billion, including growth of 2.3% in 2015 alone. Charter is amongst the largest providers of cable services in the United States, offering a variety of entertainment, information and communication solutions to residential and commercial customers mainly in Tennessee, Wisconsin, Michigan, Alabama and Georgia. The company was founded in 1999 and is headquartered in Stamford, Connecticut. Financial result for 2Q15 presented revenue growth of 7.6% Y/Y, an Adj. 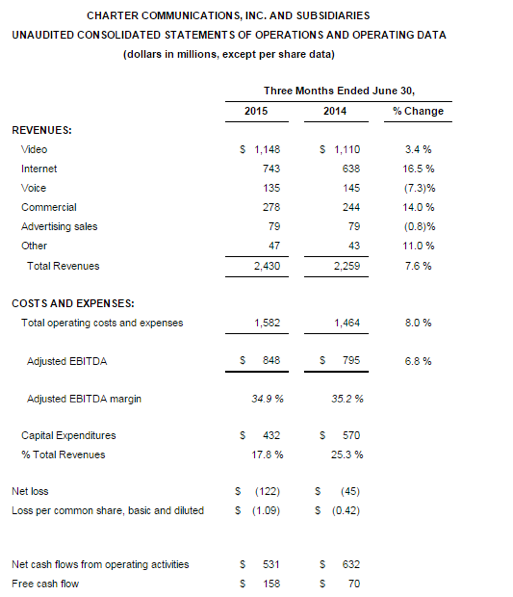 EBITDA growth of 6.8% Y/Y and free cash flow of $158M vs $70M in 2Q14 driven primarily by growth in Internet, commercial and video revenues. 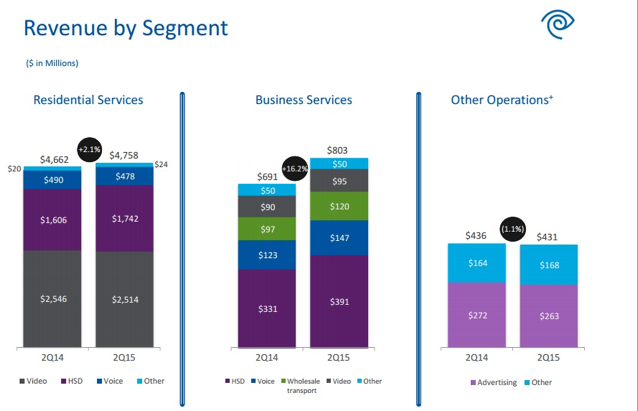 Higher advanced services penetration, annual and promotional rate adjustments, pay-per-view events, higher expanded basic and digital penetration drove video revenue growth. Moreover, while an increase in internet customers by 393,000 during the last year and a promotional roll off, price adjustments and revenue allocation from higher bundling led the way for the Internet revenue growth. Charter’s current focus is on improving product and customer relation, in fact investments in network performances and in insourcing have been made with the purpose of obtaining faster broadband speeds, better video product and a better customer service. The company stated interest in a dimensional expansion, using economies of scale to obtain “greater product innovation” and to bring “new advanced services to consumers”. As of December 31, 2014, it served approximately 4.2 million residential video customers; approximately 4.8 million residential Internet customers; approximately 2.4 million residential voice service customers; approximately 619,000 commercial primary service units, primarily small- and medium-sized commercial customers. Time Warner Cable Inc. (TWC from now on) is among the largest providers of video, high-speed data and voice services in the U.S., with cable systems located mainly in five geographic areas – New York State, the Carolinas, the Midwest (including Ohio, Kentucky and Wisconsin), Southern California and Texas. TWC has three reported business units: Residential Services, Business Services and Other Operations. Through the Residential Service business unit, TWC offers video, high-speed data and voice services, as well as security and home management services to residential customers. With the Business segment high-speed data, networking, voice, video, hosting and cloud computing services are offered to business customers at retail or wholesale level. TWC’s Other Operations segment principally consists of an advertising sales arm plus some local sport, news and lifestyle channels. As financial results showed, growth in residential high-speed data revenue was the result of growth in high-speed data subscribers, as well as an increase in average revenue per subscriber primarily due to increases in prices and equipment rental charges and a greater percentage of subscribers purchasing higher-priced tiers of service. Residential video revenue decreased due to a year-over-year decline in video subscribers. In the future, TWC will continue improving customer experience and network expansion through TWC Maxx: a project aimed at improving network reliability, upgrading older customer premise equipment and expanding its network to additional residences, commercial buildings and cell towers. The deal values Time Warner Cable at $78.7 billion. Charter will provide $100.00 in cash and shares of a new public parent company (“New Charter”) equivalent to 0.5409 shares of CHTR for each Time Warner Cable share outstanding. The deal values each Time Warner Cable share at approximately $195.71 based on Charter’s market closing price on May 20, approximately a 18% premium. Take $100 cash and New Charter shares worth 0.5409 of a Charter share for a Time Warner Cable share. Take $115 cash plus New Charter shares worth 0.4562 of a Charter share in New Charter for a Time Warner Cable share. If TWC’s shareholders choose the first option, they will own 44% of New Charter. Charter’s shareholders will then own 24%, while Liberty and Advance/Newhouse will own 19% and 13% respectively. 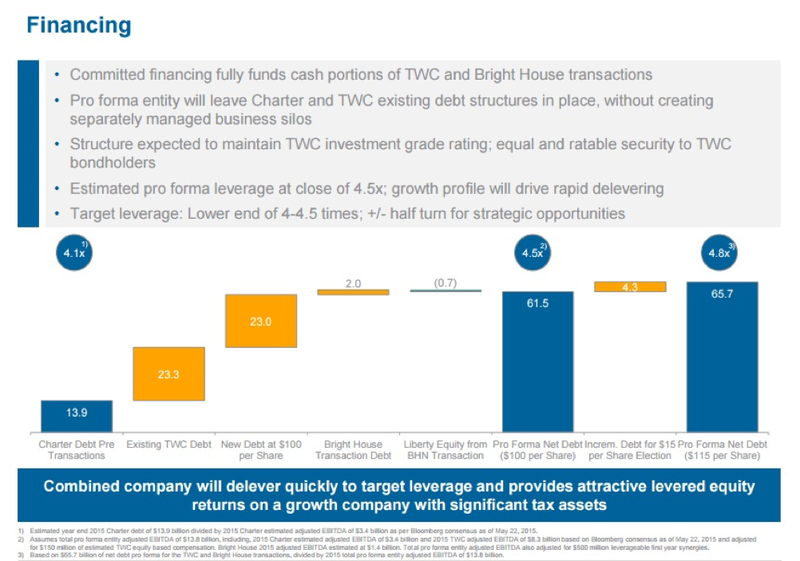 In the other case, TWC’s shareholders will own 40% of New Charter, Charter’s shareholder will own 26% while Liberty and Advance/Newhouse will own 20% and 14% respectively. Charter plans to borrow between $25B to $29.3B to fund the purchase. Time Warner Cable already carries debt worth $23.3B on its balance sheets while Charter’s pre-existing debt obligations amount to $13.9 billion. The companies estimate that New Charter’s total debt could cross $65B once the transaction is completed. The combined 2014 revenue for the merging companies sums up to $35.7B while combined adjusted EBITDA amounts to $12.9B. This results in a potential Debt-to-EBITDA ratio of 5.09 for New Charter. By comparison, the 2014 adjusted Debt-to-EBITDA ratios for pay-TV rivals Comcast, DirecTV and Dish Network were 2.00, 2.58 and 4.97 respectively. Pre-merger Time Warner Cable has a Debt-to-EBITDA ratio of 2.82. New Charter risks to have its rating downgraded to sub-investment grade. Charter’s goal with this deal is to expand its customer base over the country while including networks of some of the largest US cable players. Time Warner Cable is the second largest cable operator in the US. The combined entity will reach 48 million households. Also, New Charter will have 24 million customers. Together, the three cable companies will cover nine Designated Market Areas in the top 25. Bright House brings two DMAs (Tampa and Orlando) to the proposed company, both are top 20 DMAs. Furthermore, New Charter will benefit from the scale of cable operations in the US. New Charter will have the second largest Internet subscriber base in the US – 19.4 million customers, while market leader Comcast has a subscriber base of 22 million. 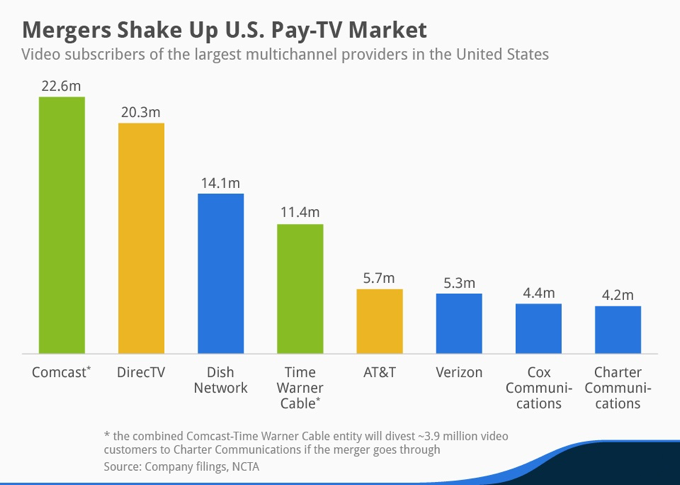 The same will happen in the Pay-TV market, where the combined entity will have 17.3 million video customer, against market leader DirectTV-AT&T, which has 26.3 million customers. New Charter will use this base to negotiate content and programming costs representing ~38% of Time Warner Cable’s operating expenses in 1Q15. As in the previous Comcast deal, the risk is that Federal Communications Commission, agency of the United States government regulating interstate communications, will not approve this deal if it is not of public interest. There are several differences from the Comcast’s experience and our vision remains positive. In fact, Comcast owns NBC Universal which in turn owns media network and the NBC broadcasting network, while TWC and Charter are both core cable companies with an average market share, thus there is no risk of total vertical integration and/or lack in fair market competition. 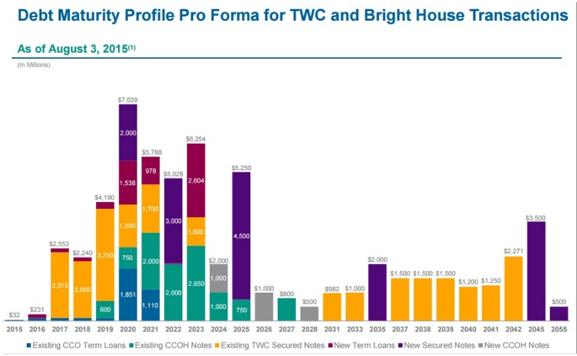 A combined Charter-TWC-Bright House would serve 20 million customers in the broadband market (24% of the market) and only 17% of Multi Video Programming Distributor (MVPD) subscribers.